This is another atc for a private swap. All images stamped onto Adirondack Inked direct to paper and then collaged. I like the combination of nursery colours. I've got visions of these two little girls being refugees arriving at their new destination which is why they are carrying an important message! Why they couldn't be just two youngsters going on holiday, I don't know. Love that western union letterhead and the little ones are such sweet images! love the background and the subtle color changes! very fun! your style is so fresh, lovely to see! Your other latest art is such fun to see, you have been "overflowing"! Your atc is wonderful....I love that soft color with the image! Thank you for your kind comment today..it is so much appreciated! I just love your style!! The thing I love so much about art journaling is how you can add a direct message or idea with words and not just hope your viewer "gets it." Hi Penny you have been one busy bee since I was here last some brill work but then again it always is...it's freash ans original. well done keep up the good work...ooops sound like a teacher sorry lol. Very nice ATC, it has something mysterious, and I like it!! I think they are war time evacuees as they look a little anxious. It's lovely Penny. This is a gorgeous ATC. I love the stamps you have used & the soft colouring. Hi, I just found your comment on my music of my life blog, thanks so much for your support and kindness. I am happy to say all music is safe for me again, as my mum has been given the all clear from cancer after the surgery she just had. 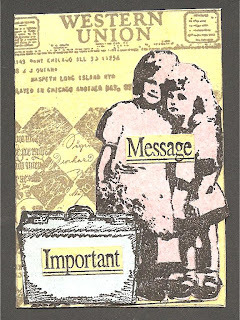 I love your ATC, and the one from your last blog post too, very light and delicate.